Leprosy - catch, body, contagious, causes, Keyword, What Is Leprosy? Leprosy (LEP-ro-see) is an infectious disease that damages the nerves, skin, and mucous membranes. It is caused by the bacterium Mycobacterium leprae. It is slowly progessive, which means that it slowly becomes worse and worse. The disorder also is called Hansen's disease, after the Norwegian physician who discovered its cause in 1874. A disease that can cause extreme disfigurement and disability, leprosy has been among the most dreaded of diseases throughout human history. It was known to the ancient Babylonians, Hebrews, Greeks, and Romans, and is mentioned frequently in the Bible. Until comparatively recent times, leprosy was incurable, and people with leprosy were sent away from the communities in which they had lived. Leprosy became widespread in Europe in the Middle Ages, probably aided by the large movement of populations during the time of the Crusades. By the 13th century, there were more than 2,000 institutions for people with leprosy in France alone, and hundreds more in Germany, England, and Scotland. Although the disease had almost disappeared from Europe by the 1500s, outbreaks occurred in Scandinavia and the Hawaiian Islands in the 1800s. Leprosy is uncommon in most countries today, but it causes massive suffering in the areas where it is still found. These areas are largely confined to tropical and subtropical regions of Africa, Asia, and Central and South America. The disease rarely is seen in North America and Europe. In the United States, most cases occur among people who came from other countries. Balakot Leprosy Hospital in Pakistan. 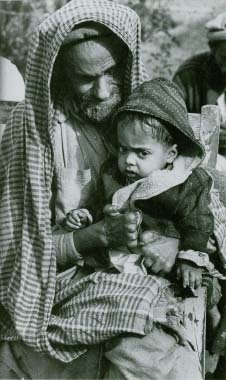 A man who has lost his fingers from leprosy is shown with his healthy grandson. © 1973 Bernard Pierre Wolff/Photo Researchers, Inc.
Children are more susceptible to leprosy than are adults, and men are more likely to get the disease than women. In terms of living conditions, the incidence of leprosy is greatest in areas of dense population that have poor nutrition and sanitation, and lack of adequate medical care. How Does a Person Get Leprosy? Contrary to what most people believe, leprosy is not highly contagious. In fact, it is very difficult for one person to catch it from another. There are two reasons why this is so: the bacterium itself does not easily cause disease, and, in any case, almost everyone's immune system can ward it off. Only close contact for a long period of time with a person whose disease is in an advanced stage is likely to cause infection. It is believed that the bacterium travels from person to person by way of the respiratory tract, through discharges from the nose or mouth, such as sneezing or coughing. The incubation period, from the time of infection until the disease sets in, is very long, usually from 1 to 10 years or more. What Are the Symptoms of Leprosy? Leprosy does not cause fingers and toes to fall off; this is another myth connected with the disease. Leprosy can lead to severe damage to such peripheral parts of the body (such as hands and feet), however. There are two main types of leprosy, called the tuberculoid (too-BER-ku-loid) and the lepromatous (lep-RO-ma-tos). The tuberculoid is the milder form, and it mainly involves the skin and the nerves that supply the skin and other surface parts of the body. Lepromatous leprosy mainly affects the skin, but the infection tends to progress and become more widespread. It is the more severe form. Tuberculoid leprosy begins as an infection at the nerve endings. Gradually, there is a loss of feeling around them, and pale areas develop on the skin. Over a period of years, these lesions * widen and thicken. Muscular paralysis often develops in the hands and feet. Accidental injuries may not be noticed in areas where sensation has been lost, so that fingers and toes can easily be damaged and scarred. In some cases of tuberculoid leprosy, healing may occur by itself. In the lepromatous form, large soft nodules, or lumps (lepromas), develop over the body. Facial features may become greatly enlarged, producing a characteristic lion-like appearance. The mucous membranes of the nose, mouth, and throat may be invaded by the infection. When the eyes are affected, blindness often results. The progression of leprosy is highly variable, and symptoms may come and go in some individuals. How Is Leprosy Diagnosed and Treated? The signs and symptoms of leprosy can resemble those of some other conditions that affect the skin and nerves, especially when the disease is in its early stages. Diagnosis must therefore be made by doing a biopsy, in which a small piece of skin is taken to analyze for the leprosy bacterium. Early diagnosis is very important because it can prevent permanent deformities and disability. Treatment of leprosy today is with a prescription drug that kills the bacteria. Other drugs have lately been added to treatment because of the growing resistance of the bacteria to the original drug in recent years. To prevent leprosy from coming back, drug treatment is usually continued for at least 2 years. Various operations can be performed to help patients who have become disfigured or have developed physical handicaps. In the United States, the Public Health Service makes treatment available for patients with leprosy, and there are specialized hospitals and dinics in different areas. Because leprosy is much less contagious than once believed, it is no longer considered necessary to prevent the spread of the disease by isolating patients from other people. Father Damien (DAHM-yan) was the religious name of Joseph de Veuster, born in the village of Tremeloo in Belgium on January 3, 1840. De Veuster knew when he was a young boy that he was meant to be a priest. He soon became a missionary and left Belgium to work in the Hawaiian Islands. There, in the course of his work, he became an accomplished carpenter and builder, and even had a basic stock of medicines to help the sick. In the meantime, leprosy had reached the islands and had begun to spread among the native populations. To isolate the disease, a colony was established on the island of Molokai, and those affected were brought there and abandoned. Father Damien chose to work in this lonely, sad, and lawless settlement, beginning in 1873. He not only attended to the spiritual needs of the diseased, but also bandaged their sores, provided food, built shelters, and buried the dead. In time, his efforts and achievements attracted the support of doctors and hospitals, and he began to receive distinguished visitors at what had become his model colony. He eventually developed leprosy himself and died from the disease on April 15, 1889. The best way to prevent the spread of leprosy is the early diagnosis and treatment of people who are infected. For at least 5 years after contact with an infectious person or household contacts, immediate and annual examinations are recommended. hey this site is KOOL! that is the way to show people about there disease!